Many compressors , including the Waves V-Comp pictured here, offer a very useful auto‑release or auto‑recovery facility, which allows the compressor to respond differently to transients and to sustained sounds that exceed the threshold. But that's rarely a good option for compressors used in parallel with the dry source signal. When doing what I thought were some last listening checks for a mix, I heard some annoying rapid volume changes in the piano track. 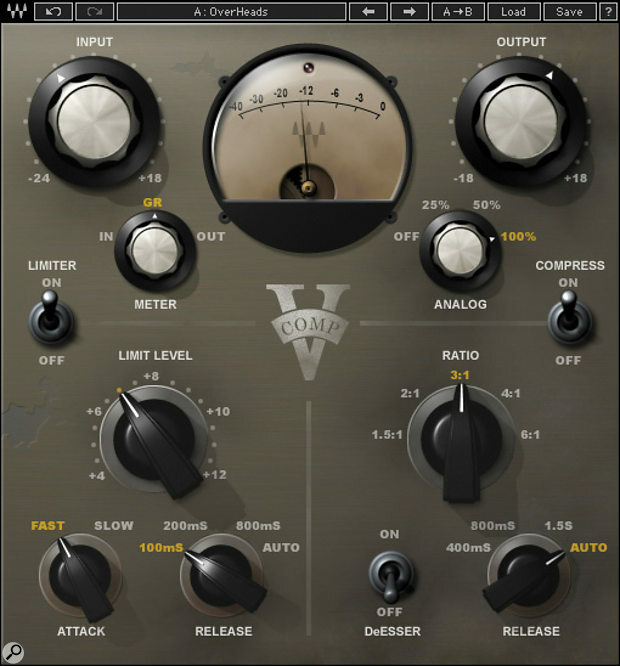 I tracked it down to the Waves V‑Comp plug-in that I was using for upward compression on the piano bus. The release time was set to 'auto'. On long sustained chords, the gain‑reduction needle was wiggling rapidly back and forth as the chord decayed. Setting the release instead to a fixed time of 1.5s solved the problem. I usually don't use the auto setting, but for some reason had tried it and forgot about it. The Waves V‑Comp manual just says: "Auto adjusts the release time according to the input signal to achieve a 'nominal' release." Could you please explain what this kind of auto-release setting actually does? What is it trying to accomplish? SOS Technical Editor Hugh Robjohns replies: The exact implementation varies between different manufacturers' designs, but in its simplest form the auto‑release (or auto-recovery) setting switches between two different release time constants — one is very fast, and the other very slow — depending on the amount of gain reduction being applied at the time. The aim is to give the best of both worlds: a fast recovery for brief transients (to maintain a sense of loudness), and a slow recovery for more gentle level-smoothing. So when a large amount of gain reduction has been introduced — something that would typically be triggered by a brief transient peak — the recovery time will be very fast, and this rapid change of level up and down maintains the impression of a loud dynamic sound, while still being dynamically controlled. However, for smaller amounts of gain reduction, such as for much more modest changes of source level, the recovery time is much slower, so that there is no audible change of noise floor (an effect often called noise-pumping). With auto-recovery selected, if you look at the gain-reduction meter when the compressor is hit by a loud transient, you'll see it swing over to the appropriate amount of gain reduction, then fall back rapidly to about 4-6 dB of gain-reduction, and at that point it will slow right down as the rest of the attenuation gently ebbs away. In normal downward compression applications, this auto-recovery system usually works brilliantly well. In fact, I usually leave the compressor set to auto unless I require a particular time-release setting for a specific effect. However, when configured for parallel compression (which I'm almost certain is what you mean here by 'upward compression'), you're deliberately operating with large amounts of gain reduction all the time. Consequently, the auto mode will be operating with a very fast recovery time and, just as you noticed, that's not what you want in your situation! Hence the need to manually select a slow recovery for your specific application.